Tengo que decir que es INCREIBLE que nadie haya posteado a esta banda siendo ellos una de las bandas del mainstreem mas importantes y conocidas... en fin. Bueno pues los Leaves son una banda formada por el matrimonio Kristie-Krull cuando Liv dejo a Theatre of tragedy (segun la historia fue "despedida") todo esto por que Liv ya no estaba muy convencida del camino que su banda original estaba llevando. Al casarse con Alendander Krull Liv no dudo ni tres segundos en aceptar la propuesta de su nuevo esposo: formar una nueva banda a su entero gusto, de esta forma los miembros de la banda Atrocity (banda original de Krull) serian usados como una nueva banda, un concepto nuevo llamado Leaves eyes recayendo la parte vocal principal en Liv y en los coros y acompañamientos a su esposo Alexdander krull. Una de las cosas que notaran primero es el hecho de que los Eyes son Viking metal personalidad que la misma Liv le ha dado desde un principio, sus letras son basadas en leyendas Noruegas y celtas, con arreglos folk que en su mayoria se distinguen por el uso de flautas y gaitas, tambien ahi que señalar que han contado con la colaboracion de algunos invitados, entre ellos la misma hermana de Liv Kristie y vocalista de la banda Sigrlinn. El estilo viking metal-folk se asentaria hasta el poderoso Meredead, disco que es la cuspide de su estilo y la confirmacion de un estilo que fue madurando disco tras disco. Por desgracia al parecer a los mirmbros de Atrocity no les agrada mucho la idea de ser musicos de dos bandas diferentes, ya han cambiado de musicos como de calcetines, toda la formacion de musicos cambia casi cada disco... pero fuera de ahi son una excelente banda si dejamos a un lado el lado estupido y frivolo de esto. Aunque al decir verdad, me considero más fanático de los dos primeros discos xD a mi juicio personal creo que luego llegaron a ser un poco monótonos. Aunque sin desmerecerlos... tienen temas fantásticos como el mismo Melusine o Take the Devil in Me. Me trae ene recuerdos ésta banda... cuando pequeño escuchaba una y otra vez canciones como Norwegian Lovesong, Elegy o Twilight Sun. Pues es de los mejores, anoto. Hafrsfjord, Norway's west-coast. A.D. 873. Did you hear what happened? Harald Hårfagre (c.850-932), remembered by medieval historians as the first king of Norway. The battle of Hafrsfjord is described in the Saga of Harald Hårfagre (Harald Fairhair) in Snorri's Heimskringla. Harald defeated several petty kings and the battle is considered decisive in the unification of Norway. The seabed in Hafrsfjord hides many secrets and many traces. Moreover, Hafrsfjord is my birthplace. With our upcoming album we would like to take you on a journey through a highly interesting chapter in Scandinavia's history. Those of you who were present at our latest concerts surely noticed that there's one new song on our setlist, "Halvdan the Black" - one chapter of the upcoming album "King of Kings"! Halvdanr Svarte (c.810-860) was a ninth-century king of Vestfold, Norway. He belonged to the House of Yngling (son of Odin' line) and was the father of Harald Fairhair. "Halvdan the Black" is just the start of an amazing adventure! This production is one unique soundtrack - a brilliant and impressive auditive experience. The album was recorded in Germany, Norway, England, Netherlands, Belarus and Switzerland. "King of Kings" is produced by Alexander Krull at Mastersound Studio. Outstanding musical colleagues and ensembles have contributed with their guest appearances like the London Voices Choir (Lord of the Rings, Star Wars, The Hobbit, Harry Potter). The fantastic artwork is done by Stefan Heilemann (Lindemann, Nightwish, Epica, Kamelot). Dear Fans & Friends - get ready for "King of Kings" - out September 2015! Mira tú por dónde, acabo de comprarme tres discos de ellos (Vinland, Njord y Symphonies) y ya me están poniendo otro delante...¡Qué vikingos que son! Está mucho mejor que bien. Si el resto va en la línea me lo tendré que comprar. Me gusta mucho Leaves' Eyes, aunque no puedo decir que los haya escuchado tanto como Nightwish, Epica u otras bandas del rubro. De sus discos me quedo con Njord y Vinland Saga, aunque de su discografía llegué hasta el Meredead, aún no he tenido chance de escuchar sus últimas dos placas. Vinieron a mi país este año, no pude ir y lamentablemente por lo que supe la asistencia fue bastante baja, una pena porque con esas ya no es probable que vuelvan a venir, era una única chance para verlos en vivo y me la perdí. Liv se va de la banda! with the upcoming shows, tours and releases Leaves' Eyes will introduce their new female singer: Elina Siirala, Finnish vocalist living in London. 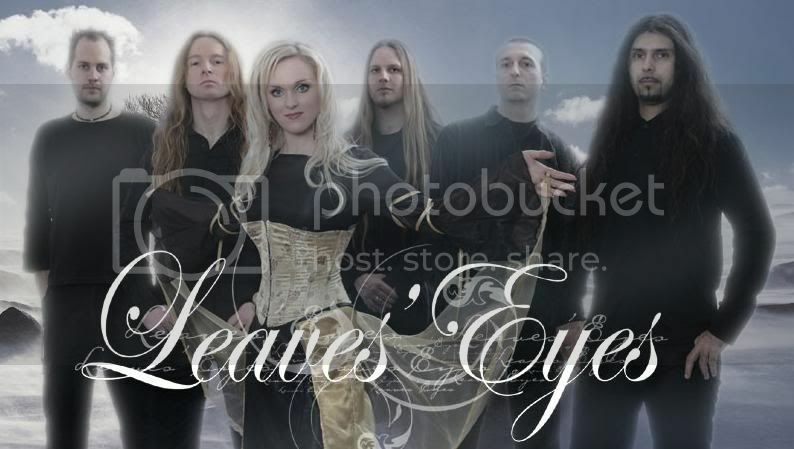 Leaves’ Eyes and former vocalist Liv Kristine will part ways. Liv Kristine comments: "I am highly proud of having been founding member and front lady of Leaves' Eyes, which has played a vital role in my life since 2003. Good luck guys, thank you for the amazing music, outstanding moments with our worldwide audiences, moreover, the passion we all share. Love, Liv"
Elina comments: "I can’t quite express how grateful and honored I am for being asked to join Leaves’ Eyes, one of the most iconic bands in symphonic metal! I have the utmost respect for Liv and the band and what they’ve achieved over the years! I take on this challenge with a huge excitement and look forward to the new chapter in my career. It’s truly thrilling to be working with such talented musicians who also are some of the nicest people I’ve met. My biggest passion is to make music and perform, so right now I can’t wait to see what the future will bring!" Leaves' Eyes: "We embrace Elina with open arms and hearts! She is a fantastic singer and performer. Please, welcome the new female voice of Leaves’ Eyes: Sensational Elina Siirala!" Leaves’ Eyes will be touring around the globe with the new singer Elina Siirala! Check out the tour dates. The live world premiere will be in Jakarta, Indonesia. Moreover, there will be an Earbook tour edition of „King of Kings“ released in June, including a new version and video clip of „Edge of Steel“ feat. new singer Elina! On top there will be an US Edition of „King of Kings“ incl. the new version of „Edge of Steel“ as a Bonus track. Bonita voz, aunque no se como quedará en Leaves'Eyes! ¿Ahora qué va a pasar con Liv? Seguramente continuará como solista y ocasionalmente como invitada, pero no sé si formará un nuevo grupo o se unirá a otro. Desde luego, muchos querría tenerla entre sus filas, pero ella ya es una artista muy establecida y no le hace falta "colgarse" de otros grupos para ganar fama. A Elina Siirala no la veo mala cantante, pero se me va a hacer muy raro oír una voz tan ruda y contundente en Leaves' Eyes. Todos tenemos asociada la voz delicada y aguda de Liv al sonido de la banda, formaba un contraste muy grande con Alexander Krull, pero ahora todo eso se nos ha venido abajo. Yo veo a Elina capaz de sacar el grupo adelante sin problemas, pero aún es pronto para estar seguros de nada. Me reservo mi opinión hasta que la haya oído interpretando los temas antiguos o en un futuro álbum. Qué duro, no me esperaba esto para nada. it's with sadness I see the latest news reaching you. That this chapter in my life would have to end so soon was not my intention. Life must go on. For all of us. I wish Leaves' Eyes with their decisions and plans all the best for the future. I will keep you posted with good news soon! Esto es muy raro! Se habrá divorciado? Alex Krull sigue en el grupo, así que es muy posible. Y por si esto fuera poco, Liv anuncia un show especial con su ex-compañero de Theatre of Tragedy. Aún falta mucho, pero yo desde luego no me lo pierdo. Un dato: El último post de Liv relacionado con la banda es del día 8. Así que, lo que haya pasado, ha sido esta semana. Ahora si que ya no entiendo nada! Fantastic news!! Special show at Metal Female Voices Fest! See you all at MFVF! we are just back from a great weekend in Indonesia. Our first show with Elina went awesome! Despite a heavy tropical storm before the gig 21.000 people showed up in front of the stage! We understand that many fans and friends are surprised and shocked about the change in our band. We all know Liv had an important role for the band in the past, and we understand people are sad as it was not an easy decision for every one involved. 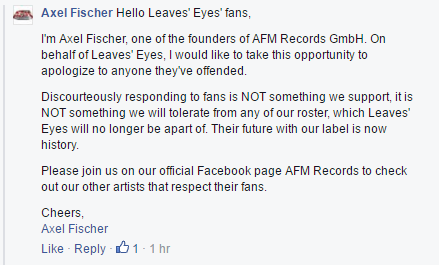 Leaves’ Eyes has always been a band, and not a project, nor a Liv Kristine solo project at all. We always worked as a team in Leaves’ Eyes. In the last decade Tosso and Alex wrote the music for Leaves’ Eyes and Liv took care of the lyrics. Liv’s solo project is called "Liv Kristine“. We supported Liv also in her solo career, writing music, recording and producing albums and doing management in the past. The decision to part ways with Liv was taken by all Leaves’ Eyes members, including Liv. A mediator - a friend of Liv and Alex - was at the band meeting who can witness that the decision of parting ways was agreed by all members. Liv was happy to have the opportunity to plan changes in her future life and she does not have to go on tour so much anymore. The idea to go separated ways came up already in January. Elina was no part of this decision or process. It was also agreed to help Liv for her solo project „Liv Kristine“ and record her new demo songs and her further projects at the studio just like in the past. Please respect the privacy of Liv and Alex! Disrespectful postings and bashing is harming their family situation and their son Leon. Liv and Alex don’t want to split fans - don’t give false rumors, haters and bashers a chance! At the moment we can’t tell you more details as legal actions are in process. To our world wide fans who are there for the music and not the gossip: LET THE MUSIC TALK! We are looking forward to present new material with Elina soon! Stay tuned for news of our upcoming video clip, music and tour updates. Felicito a Liv por los ovarios que tuvo para salir a decir la verdad de la milanesa. Los dejó como unos cobardes a los de la banda por salir a decir que era todo acordado y color de rosas, cuando no fue así. Doble discurso por todos lados. Aparte que tu marido te haga eso.... debe ser horrible la situación que está pasando. La creo! Mirad sino el FB de LE hasta el día 8! Compartió post de la banda hasta ese día! Y hay un comentario en ese post diciéndole a Liv que Elina llevaba ensayando desde Pascua. Y ella contesta: "No me dijeron nada"
Por cierto, porque se fue Liv de Theatre of Tragedy? Nunca llegué a enterarme bien de lo que pasó. Vamos, que la han echado. Nadie quiere decirlo, pero es así. Me parece muy feo que por un bache en su vida personal se pongan a conspirar a sus espaldas (o puede que sea por otra cosa, no sé). Y leyendo entre líneas, a ella también le parece "sospechosamente rápido" el cambio de vocalista. Lo que interpreto es que Alex y Elina quizá sean más que amigos. Liv dice "Se ha hecho todo a mis espaldas y aprovechando una gran decepción de mi vida personal"
Pues sí, es lo que parece. Está muy claro. Muchos veían a Liv como una persona egocéntrica, pero después de esto (y de más dramas que ya conocemos), está visto que el más inocente acaba siendo el más capullo de todos. Qué triste me ha puesto el mensaje de Liv en Facebook, cuando dice que echará de menos los conciertos, las canciones... Ser famoso te acaba trastornando tarde o temprano y casi nadie es capaz de sobrellevarlo. Puede ir esto a peor? Sí puede! Fijaos en las fechas! Es su trabajo! Normal que lo eche de menos. Me da mucha pena Liv, sin matrimonio, sin banda... Espero que lo supere! Y que saque un album muy bueno y tenga muchos conciertos! t's an impressive shitstorm you've managed creating here Emoticono smile Maybe it would have been prudent to not have been like a petulant kid when, as we know, you are the culpable one for this whole situation Alex? Parece que la discográfica los ha despedido! Liv en modo "Esto es lo que hay. Pasemos página"
También han quitado a Simone de la canción? Habrá que esperar al vídeo completo.